Physics Essays 18(2) (2005): 150-163. In print as of January 2007. In 1979, while still a doctoral student at Portland State University in Portland, Oregon, Paul LaViolette made a prediction, which like Einstein’s prediction of the bending of starlight may one day be destined to shake the world. At that time, he was developing a unified field theory called subquantum kinetics. (1-3) Unlike string theory, which has never made any testable predictions, LaViolette’s subquantum kinetics theory has made a number of apriori predictions, ten of which have thus far been confirmed. (4) One in particular challenges the most fundamental of physical laws, the law of energy conservation. Subquantum kinetics predicts that a photon’s energy should not remain constant but rather should change with time, that photons traveling through interstellar space or trapped within stars or planets should continually increase in energy, although at a very slow rate. For example, his theory predicts that a photon traveling through our solar system should increase its energy at a rate of somewhat greater than one part in 1018 per second. 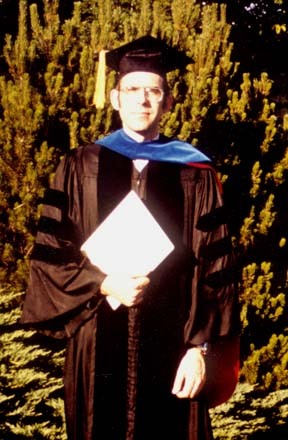 Paul LaViolette at Portland State University after graduation in 1983. This “unexplained” phenomenon has come to be known as the “Pioneer effect” or as the “Pioneer anomaly.” Hence the NASA JPL findings were a direct confirmation of the effect that LaViolette had sought. As LaViolette notes in his paper which appeared recently in the journal Physics Essays,(6) the frequency blueshift observed in Pioneer spacecraft maser signal data was within two standard deviations of the amount he had predicted as early as 1980. The JPL group attributed this blueshift to an anomalous force accelerating the spacecraft toward the Sun. In his Physics Essays paper, LaViolette points out that their anomalous force interpretation is problematic since, if a force of the magnitude they proposed were present, it would also necessarily be pushing the planets towards the Sun and cause their orbital periods to accelerate. But the planetary orbital periods are known to very high precision, and astronomical data shows that no such orbital acceleration effect is present, a point also acknowledged in Anderson’s paper. Imagine a photon’s energy to be like money that you put in a bank. According to subquantum kinetics, if you come back in a billion years, the photon will have earned 10% interest. That is, you will find the photon to be 10% more energetic. This excess energy is a violation of the law of energy conservation, the First Law of Thermodynamics, which requires that the photon should have the same energy no matter how many billions of years your photon money is left in the bank. While the rate of energy change that LaViolette proposes is far too small to measure in the laboratory, if present it would be extremely significant for astrophysics. Essentially, it would require that astrophysicists scrap all their existing theories on stellar evolution and stellar energy production. Although the energy excess produced by any given photon each second would be incredibly small, when the cumulative effect of trillions upon trillions of photons inside a planet or star are added up, the amount of energy becomes quite sizable. LaViolette coined the term “genic energy” to refer to this spontaneously created energy which he says should be continually produced within all celestial bodies and which can account for most if not all of the energy radiated by planets and red dwarf stars. An early test of the genic energy prediction he conducted in 1979 determined whether planets such as Jupiter, Saturn, Uranus, and Neptune might be producing energy in their interiors. The answer was affirmative. Infrared telescope measurements made by various spacecraft showed that indeed the planets radiated substantial amounts of heat from their interiors. As a further test, in 1979 LaViolette plotted the mass-luminosity coordinates for each of these planets along the mass-luminosity trend line for red dwarf stars. They conformed to this relation just as his theory predicted. This conformance is unexplained by standard theories, leaving the genic energy concept to be the only viable explanation. In fact, it was by performing a model fit to this planetary-stellar M-L data that LaViolette was able to derive a numerical value expected for the rate of photon blueshifting in interplanetary space. Routinely the U.S. Patent Office rejects patents on so called free-energy devices that claim to generate energy without burning any kind of fuel by citing violation of the First Law of Thermodynamics. Even though the inventor in many cases provides signed affidavits of witnesses claiming to have tested the device, many inventions which might provide us with an alternative to burning hydrocarbon fuels end up in society’s trash bin. By substantiating LaViolette’s earlier work, JPL’s findings cast doubt on the absolute validity of this law. With global warming well upon us, it is time the physics community gives serious consideration to LaViolette’s prediction. 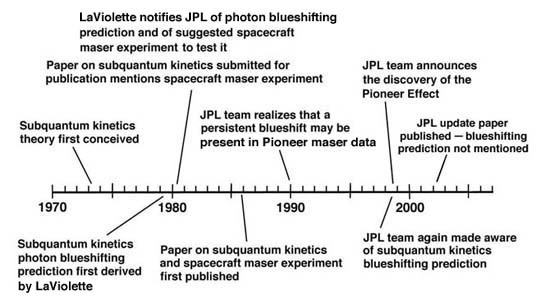 Time line indicating date of LaViolette’s prediction and date of its verification by the JPL team. 1) Paul A. LaViolette, “An introduction to subquantum kinetics.” Parts I, II, and III. International Journal of General Systems 11 (1985):281-345. 2) Paul A. LaViolette, Subquantum Kinetics: A Systems Approach to Physics and Cosmology (Niskayuna, NY: Starlane Publications, 1994, 2003); https://starburstfound.org/LaVioletteBooks/Book-SQK.html. 4) See list at: https://starburstfound.org/predictions-part-2/. 5) John D. Anderson, et al., Physical Review Letters 81 (1998): 2858-2863; Eprint https://arXiv.org/abs/gr-qc/9808081. 6) Paul A. LaViolette, “The Pioneer maser signal anomaly: Possible confirmation of spontaneous photon blueshifting.” Physics Essays 18(2) (2005): 150-163.